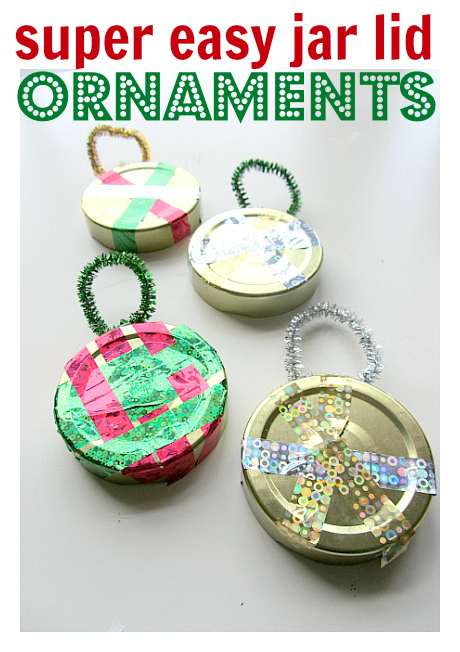 These easy Christmas ornament crafts are so simple to make and the perfect craft for school-age kids that are busy but still want to make a fun Christmas craft. 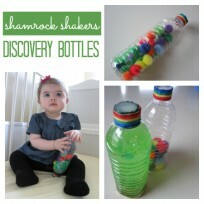 They really sparkle and are ready to go in just minutes which makes them perfect for impatient kids like my son. Also. 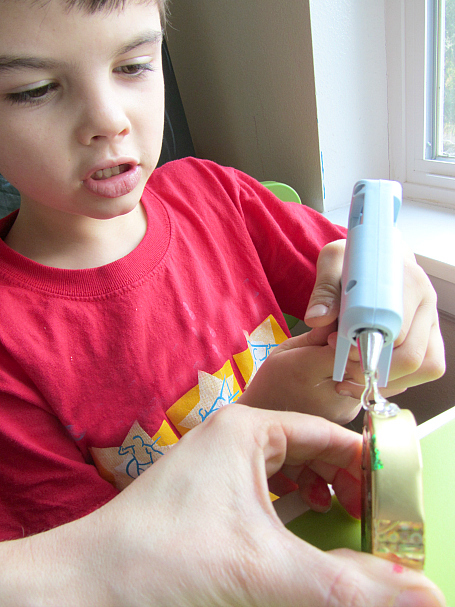 the addition of a low temp glue gun sealed the deal, my son was so excited to get to use this very grown-up tool. 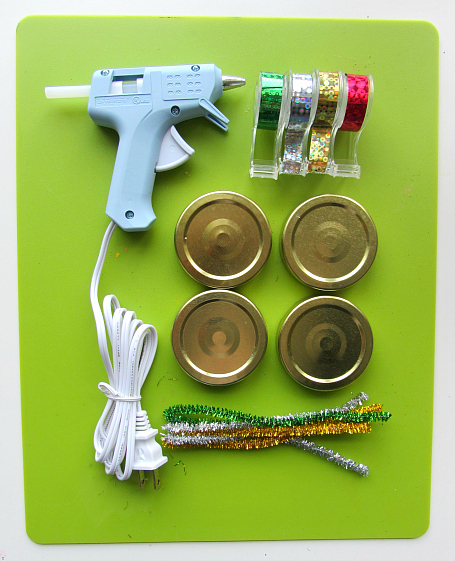 Low temp glue guns are safe for even younger kids if you have taken the time to teach them how to use them safely. 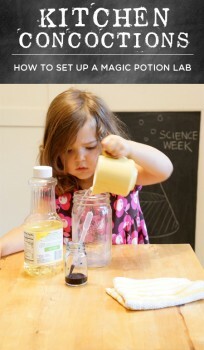 Of course, if your child isn’t ready for that you can do this step for them. Gather your materials. You will need some jar lids (ours are from my favorite Trader Joe’s salsa I love the gold tone), holographic tape, shiny pipe cleaners, and a low temp glue gun. 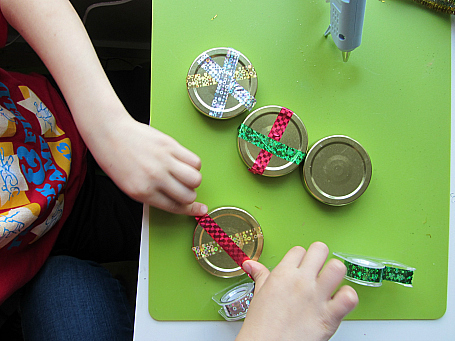 Start by adding the tape to the jar lids. My son decided he was making these for his buddies so he had clear idea of designs for each. The tape was tricky to get going at first even for a 7-year-old. 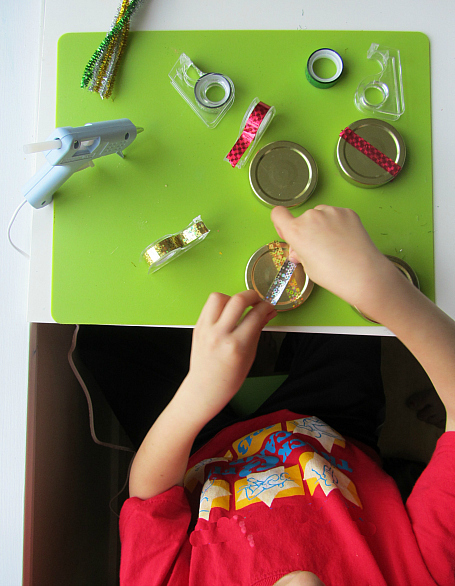 For younger kids, I would pre-cut some and place on the edge of a table or box for easy handling. Once he got the hang of the tape he was in the zone. 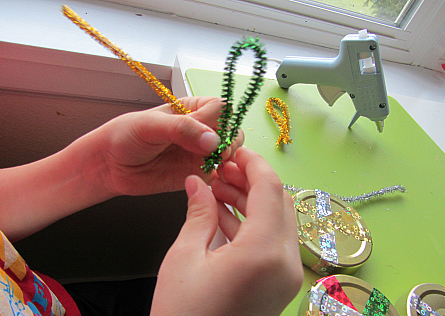 Once you finish designing, choose pipe cleaners to turn into loops for hanging. My son carefully twisted them into circles. 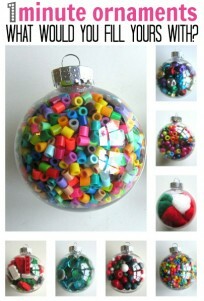 Psst, this is all good fine motor practice too! 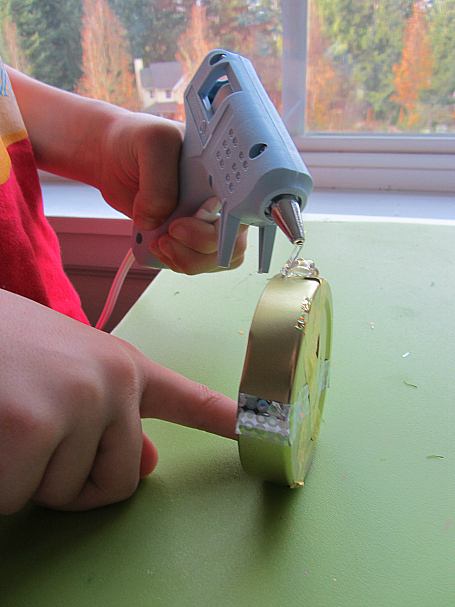 Plug in your hot glue gun and add a glob on top of the jar lid. Then place the pipe cleaner in. Hold still for a minute while the glue hardens enough to lay it down. I helped my son do the first one. and then when he was more confident he did the others. 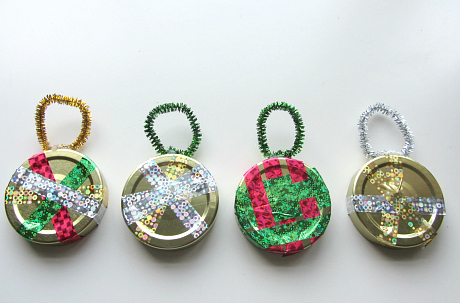 These easy Christmas ornament crafts are ready to gift to his buddies!